2008-02-06. New. Ships with Tracking Number! INTERNATIONAL WORLDWIDE Shipping available. Buy with confidence, excellent customer service! 2008-02-06. Good. Ships with Tracking Number! INTERNATIONAL WORLDWIDE Shipping available. May not contain Access Codes or Supplements. May be ex-library. Shipping & Handling by region. Buy with confidence, excellent customer service! Dover Publications. PAPERBACK. 0486601153 New Condition. . New. Dover Publications. Hardcover. 1443728063 New Condition. . New. New York: Dover Publications, 1944. Translated by J.W.T. Spinks. 257 pages. Author is Canadian Nobel Laureate in Chemistry. Illustrated with b/w figures. Pages clean, good condition. Previous owner's name blacked out at top of ffep, otherwise endpapers clean. Green cloth, black titles on spine. Edges lightly worn. VG. 2nd Edition. Hard Cover. Dover Publications. Hardcover. 1443728063 Like New Condition. . Fine. Dover Publications. Hardcover. 1443728063 Special order direct from the distributor . New. Herzberg Press, 2008-11-04. Hardcover. Used:Good. New York: Dover Publications, 1944. Translated by J.W.T. Spinks. Author is Canadian Nobel Laureate 1971 for Chemistry. 257 pages with bibliography and index. Pages are clean and good condition with 80 illustrations.Previous owner's name and address on fep and embossed stamp on title page. Green cloth with titles on spine. Light wear on edges and corners. DJ brown with titles, book reviews and Dover titles on back.Few small tears on spine and edges. VG/VG-. 2nd Edition. Hard Cover. VG/VG-. Herzberg Press, 2007-03-15. Paperback. Good. Herzberg Press, 2007-03-15. Paperback. Used:Good. Herzberg Press. PAPERBACK. 140675322X Special order direct from the distributor . New. Herzberg Press, 2008-11-04. Hardcover. Good. Dover Publications. PAPERBACK. 0486601153 Like New Condition. . Fine. New York: Dover. Near Fine with no dust jacket. 1944. 2nd ed. Hardback. 6000814860 . bookplate & light soil; 257 pages . New York: Dover Publications, Inc, 1944. WYSIWYG pricing--no added shipping charge for standard shipping within USA. Light grey cloth with printed dust jacket (jacket has ads for other Dover books on mathematical physics on both sides), xiv, 257 pp, 80 figures, 21 tables, bibliography, index. Spine ends and top corners bumped, slight edge wear, pencil underlining. DJ slightly chipped, a few small (3 mm) closed tears, spine browned; in Brodart archival cover (ads on reverse of DJ not visible unless you remove it from cover). Introductory text on atomic spectra emphasizes phenomena of general interest rather than specialized applications, develops explanations beginning with experimental results, takes solutions to partial differential equations as given rather than offering proof, but provides references where proofs are omitted. Shipping weight 2 lbs. (International 1 lb., 8 oz.). 2nd ed. . VG/VG. 22 X 14 cm. New York: Dover Publications, 1944. Translated with the co-operation of the author by J. W. T. Spinks. Second edition. 257 pp. White endpapers. Green cloth. Corners lightly bumped. VG+. New York: Dover Publications, 1944. Author was Canadian Nobel Prize winner. Second edition. Translated by J. W. T. Spinks. 257 pp. Previous owner's name on half-title. Blue card covers with brown titles. Faded spine. VG+. Dover Publications, 2010-08-19. Paperback. Good. New York: Dover, 1944. Softcover. Very Good. Second edition. Very good in wrappers, a paperback. Previous owner's name stamp on front inside panel and top text edges, name on front endpaper in ink, rubs on paper corners and edges, lightly soiled covers. Please Note: This book has been transferred to Between the Covers from another database and might not be described to our usual standards. Please inquire for more detailed condition information. CBS Publishers & Distributors Pvt. Ltd., 2008. 5th or later edition. Softcover. New. 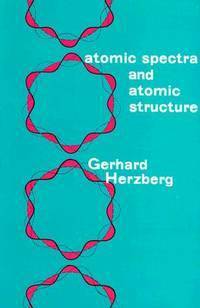 For beginners and specialists in other fields: the Nobel Laureate`s widely admired introduction to atomic spectra and their relationship to atomic structures, stressing basic principles. The treatment is physical, rather than mathematical, with experiment serving as the starting point for theory. 80 illustrations. Printed Pages: 0. CBS Publishers & Distributors Pvt. Ltd., 2008. Softcover. New. For beginners and specialists in other fields: the Nobel Laureate`s widely admired introduction to atomic spectra and their relationship to atomic structures, stressing basic principles. The treatment is physical, rather than mathematical, with experiment serving as the starting point for theory. 80 illustrations. Printed Pages: 288. Dover Publications. PAPERBACK. 0486601153 . New. Dover Publications. PAPERBACK. 0486601153 signs of little wear on the cover. . Very Good. Atomic Spectra and Atomic Structure. New York: Dover. Edges browning on few rear pages, Very Good. No Dust Jacket. . Very Good. Hardcover. Second Edition. 1944. New York, NY: Dover Publications, Inc., 1944. 2nd Edition. Paperback. Very Good. Size=5.5"x8.". 80 B/W Illus./21 Data Tables. (full book description) Dover Publications, Inc., New York, NY, 1944. 2nd Edition VG, Paperback, Size=5.5"x8. ", 257pgs(Index). 80 B/W Illus./21 Data Tables. Cover spine edges slight rubbed, ink owner name inside front cover, price sticker on Half Title Page, o.w. clean & tight. Text p ages bright and in Fine condition. [Atomic Spectra; Atomic Structure; Nuclear Physics; Science] SELLING WORLDWIDE SINCE 1987. WE ALWAYS PACK WITH GREAT CARE! Dover Publications, 1945. Soft cover, spine lined, tight binding, previous owner inscription front endpaper, 257 pages plus ads, text is clean & unmarked, good condition. ISBN: NOISBN. New York: Dover, 1944. 257 pages, translated from the German. A little marginalia and underlining,. 2nd Edition. Hard Cover. Good/No Dust Jacket. 5 1/2 x 8 ". Dover Publications. Used - Acceptable. Shows definite wear, and perhaps considerable marking on inside. Mineola, New York, U.S.A.: Dover Pubns. Near Fine/No Jacket as Issued. 1945. Revised and Corrected.. Soft Cover. 0486601153 Clean copy in near fine condition. Size: 8vo - over 7¾" - 9¾" tall . Dover Publications, New York: 1944. Softcover. Fair condition. A scientific tract that details the history of science in the early twentieth century. Includes an Index. Dover publications. Used - Good. Former Library book. Shows some signs of wear, and may have some markings on the inside. Dover Publications. Used - Good. Ships from Reno, NV. Shows some signs of wear, and may have some markings on the inside. 100% Money Back Guarantee. Shipped to over one million happy customers. Your purchase benefits world literacy! Dover. 1944. Paperback. Very Good. Trade paperback, light fading, light soiling to exterior; former owner's bo okplate on front end page; otherwise very good condition with clean text, f irm binding. ASIN: B000QA7LP6 . NY: Dover, 1945. Paper bound, first Dover edition, revised and corrected republication, illustrated, 257pp includes bibliography and index. Tight and clean - a very good or better copy. 310 grams. All books in stock and available for immediate shipment from Winnipeg, Manitoba.